The Olympic keirin heralds from Japan, where professional keirin racing is the equivalent of horse racing, drawing in huge crowds to gamble on the outcome. The riders, many of whom are millionaires from their earnings in the sport, live in schools away from any members of the public who may want to influence the outcome of the races. The common misconception is that keirin means fight – actually it means ‘racing wheels’. 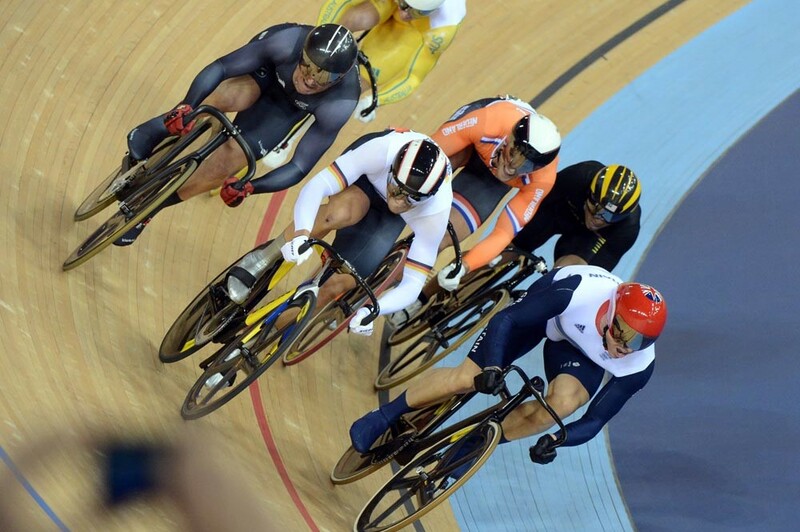 Although the length of Japanese keirin varies, in the Olympics the keirin is one for the sprinters. The riders line up side-by-side on the pursuit line and jump in behind the pacer’s bike, commonly called a derny, as it comes past. The riders’ starting position is determined by drawing lots beforehand. Position number one is at the bottom of the track and that rider should take the spot directly behind the pacer unless another rider beats them to it. The riders will somethimes jockey for the position they want behind the pacer, and it’s common to see a few nudges between riders as they fight for the best wheel to follow. What they mustn’t do is pass the derny that slowly builds its speed (the pace bike rider judges the speed through his pedalling cadence) to 50kph for the men, 45kph for the women. With two-and-a-half laps to go the pacer swings down off the track and the sprint begins. From here riders will use a variety of tactics; leading from the front, sitting in the wheels, or leaving it late with a burst of speed. “The race is six riders on bicycles, it’s a two and a half lap sprint and the race begins when the pace bike swings off. The pace, or derny bike, is a way of keeping the bunch together, it’s like a pace car in motor sport. “So basically the race doesn’t begin until the bike swings off, then it’s two and a half laps of everyone going hell for leather. It’s simple – you’re trying to cross the line first – but then there’s five or six other riders all trying to do the same. “Therefore there’s always an element of bumping and barging to get there, but it’s fast, high speed and exciting, and occasionally there are crashes. Tactics will depend on the type of race it is. Sometimes it will be a flat out sprint for two and a half laps, while other times there’ll be a bit of hesitation, but no more than half a lap of waiting before the first rider will go for it.